Learn how to use Scale, our solution for any business that needs to transact with multiple counterparties. Scale allows you to establish transactional relationships between yourself and your subsidiaries, business partners and clients, utilising a single platform to efficiently receive, convert and move funds. Traditionally, transaction clearing between trading entities is limited by the efficiency of the underlying banking system. International collection and payout, particularly involving currency exchange, often incur unreasonable fees and charges, further plaqued by lengthy processing delays. With Scale, your platform account and the counterparty accounts can be grouped together in the same ecosystem, allowing for quick fund transfers and efficient reconciliation between parties. Airwallex's feature-rich APIs allow platform customers to focus on building innovative business models, while improving operational efficiency and optimising fund management involving multiple currencies. Specifying how funds move from your account to the connected Airwallex account and vice versa. With technology and digital innovation at our core, our Scale solution is catered towards serving the new economy. Scale provides a tailored cross-border solution that is automated, efficient and transparent. Access our collection, FX conversion and global payment capability in a single platform and offer the same to your ecosystem. 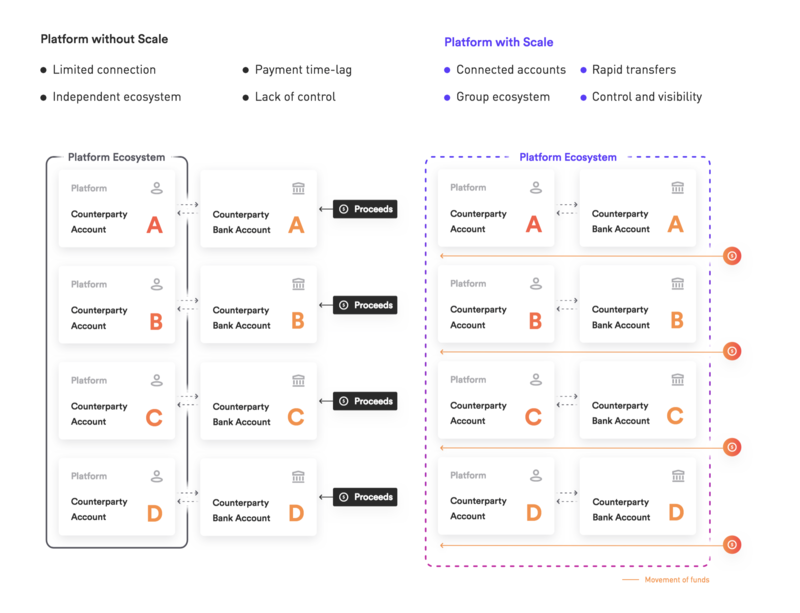 Scale is a comprehensive solution capitalising on an efficient and streamlined client onboarding process to onboard your ecosystem, creating seamless connections between your business and your counterparty accounts, enabling fast fund transfers between those accounts. Scale gives both you and your users access to our best-in-class FX capabilities. Through direct connection to the interbank FX market and partnerships with world-class liquidity providers, we source and distribute competitive FX rates for our clients. Backed by our robust infrastructure and architecture, we offer a diverse set of FX products, ranging from SPOT to forwards, available as live or carded rates, supporting G10 as well as exotic currencies, equipping your platform with the relevant tools to better manage your FX risks. Scale can facilitate specific parts of your business as well. You can access our collection, conversion and payment services on a standalone basis. The Scale offering is available to platforms and their counterparties located in all countries supported by Airwallex. Register as a platform and create your platform account by submitting your business information via the online sign up form or by contacting us directly. Once your platform account is activated, you can start creating Airwallex accounts for your subsidiaries, business partners and customers via our API. Alternatively, Airwallex accounts can be created independently by your counterparties and subsequently connected to your platform account. Define your Scale experience by determining the way you want to transact with your counterparties. As a marketplace, you have merchants offering their goods or services on your platform. Use Scale to onboard your merchants into the Airwallex ecosystem allowing them to immediately receive sales proceeds, convert from sale currency to their home currency and withdraw to their bank account. Merchants may tap into these functionalities directly through Airwallex’s web portal, or you can simply adopt our API solution to merge our components into your user interface, allowing your merchants to indirectly access all of our product features. Scale provides a complete set of customized solutions for you and your merchants. With Airwallex's flexible account system, the platform enables transparent management of end-to-end capital flows, while merchants have more control over collections, exchanges, and capital flows between virtual wallets and physical accounts. Scale unifies the management of transactions done via fragmented online and offline channels. Scale is a comprehensive wallet solution built on top of our collection, FX conversion and global payments infrastructure, allowing you and your merchants to conduct pay-in, pay-out, funds conversion and view multi-currency wallet balances in one system. It also allows you to credit sale proceeds and charge fees from your merchants’ wallets in real-time (subject to the arrangements between you and your merchants). Transfer: Facilitate pay-in / pay-out transactions as per the agreements between platform and merchants, and take full advantage of Airwallex’s Collection / FX / Payment capabilities. Scale is built and designed to support marketplaces’ requirements to process large volumes of transactions across multiple jurisdictions and currencies. Once merchants are onboarded, the system defines authorized relationships between the marketplace and merchants’ accounts, enabling real-time transaction functionality and wallet transfers to simplify settlement. Airwallex will be able to create merchant accounts and global accounts for merchants through an API. As a global logistics warehouse operator, you offer your merchants a value-add service of supply chain financing to help them bridge the working capital settlement time gap between the purchase and sale of goods. Certainty and control over funds flow: Consolidate information and funds flow into one single ecosystem, allowing you to exercise a level of control and visibility over your borrower’s wallet. This will give you the flexibility to manage your supply chain financing process as the lender, with access to your borrower’s sales proceeds from the global marketplace and hence reducing the risk of default by the borrower. Such assurance also allows you to reduce costs of borrowing and offer more competitive pricing to your borrowers. 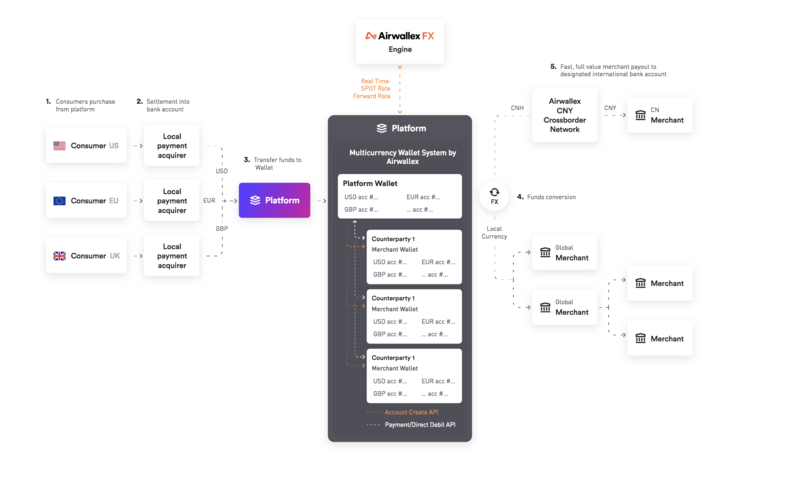 Integrated platform for platform and borrower: Efficient onboarding process and account creation for merchants via our Accounts API, integrating yours and borrowers accounts into one platform. Global account: You can create global accounts for each borrower enabling them to collect proceeds locally and globally and optimise the efficiency of incoming fund flows. Friendlier user experience: Embed Scale features in your existing user interface through our API and minimise the user experience impact for your users (i.e. borrowers). Access Scale now by registering as a Platform. Submit your business information via the online sign up form or by contacting us directly.